A recent UK survey discovered that 57% employees were accessing sites such as Facebook and Twitter for an average of 40 minutes per week. It concluded that non-business use of the social networks was costing the UK £1.38 billion every year ($2.28 billion US Dollars). Portsmouth City Council discovered that workers spent 413 hours a month using Facebook and promptly blocked the website. Other councils have insisted that staff sign a code of conduct in which they promise to limit their non-business web access. Despite the findings, 76% of the 1,460 workers surveyed stated they had not been issued with specific guidelines relating to non-work internet use. Businesses often react strongly to these survey reports and the list of banned sites on corporation firewalls can increase exponentially. But how effective can it be? 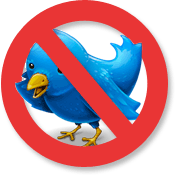 It technically simple to block Twitter.com, but there are dozens of alternative websites and applications. Even catching them all does not prevent staff tweeting on mobile phones. The social networks can also offer significant business benefits to customer support, sales, marketing, and research departments. Cordoning off huge areas of the web could be counter-productive. The survey found employees were spending an average of just 8 minutes per day using social networks. There will be people who waste far more time, but how many minutes are wasted chatting with colleagues, making a coffee, taking a personal call, enjoying an extra long comfort break, or staring out of the window? No one can ever give 100% concentration throughout the whole of an 8-hour day. There are obviously situations when employee’s personal internet use moves beyond reasonable limits. Business managers have a right to implement guidelines, monitor access, and reprimand staff who flout the rules. Perhaps I’m being overly simplistic, but I would recommend businesses either provide full internet access or ban it altogether. People are clever — attempting to control employee behavior will ultimately backfire. Has your organization blocked access to the social networks? Do they have usage guidelines? Has blocking helped or hindered your daily work?